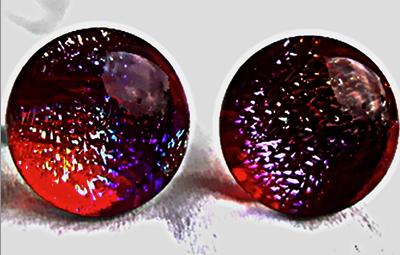 These iridescent Red Dichroic glass stud earrings have a matching bracelet. They measure 1cm x 1cm and are made of two layers of glass. A layer of iridescent Red Dichroic glass topped with a layer of clear glass fused together. The fittings are Sterling Silver. They come in a Black or Silver card gift box. There is a matching bracelet in the bracelet section.